Item number Na1503 from the MOA: University of British Columbia. 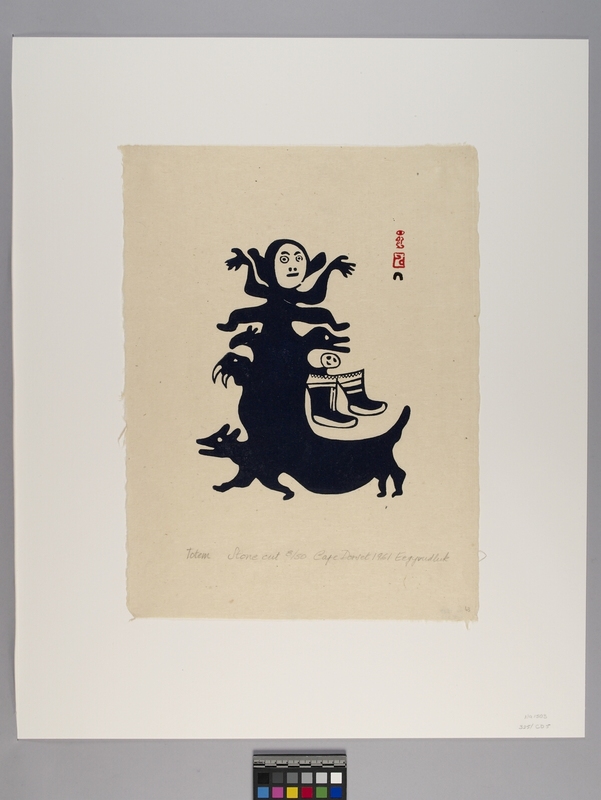 Print depicting a shared animal body with different animal heads emerging from the sides: starting from the bottom left is a dog-like head and body, a walrus head, a pair of boots with a somewhat circular shape that has two eyes and a mouth(? ), and two unidentifiable head forms with a human form at the very top that has outstretched arms and legs. 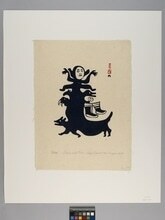 Below the image is written, "Totem Stone cut 8/50 Cape Dorset 1961 Egyvudluk. The name of the artist and the printmaker is printed in monogram form with the Cape dorset stylized igloo seal near the top right-hand corner.